Why is sleep frustrating for so many people? Why do we spend so much time and money managing and medicating it, and training ourselves and our children to do it correctly? In Wild Nights, Benjamin Reiss finds answers in sleep's hidden history--one that leads to our present, sleep-obsessed society, its tacitly accepted rules, and their troubling consequences. In this compelling story about one of the nineteenth century's most famous Americans, Benjamin Reiss uses P. T. Barnum's Joice Heth hoax to examine the contours of race relations in the antebellum North. Barnum's first exhibit as a showman, Heth was an elderly enslaved woman who was said to be the 161-year-old former nurse of the infant George Washington. Seizing upon the novelty, the newly emerging commercial press turned her act--and especially her death--into one of the first media spectacles in American history. In the mid-1800s, a utopian movement to rehabilitate the insane resulted in a wave of publicly funded asylums—many of which became unexpected centers of cultural activity. Housed in magnificent structures with lush grounds, patients participated in theatrical programs, debating societies, literary journals, schools, and religious services. 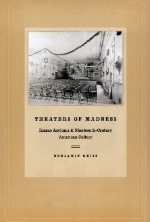 Theaters of Madness explores both the culture these rich offerings fomented and the asylum’s place in the fabric of nineteenth-century life, reanimating a time when the treatment of the insane was a central topic in debates over democracy, freedom, and modernity. "Sleeping in public is taboo. Unless you're young, white, and Privileged." Los angeles times, may 24, 2018. An op-ed that gives some context to a notorious case of a Yale student who was racially profiled in her sleep. "WHY DO WE MAKE CHILDREN SLEEP ALONE?" lOS aNGELES tIMES, mARCH 24, 2017. An op-ed piece in which I consider the social implications of our most common sleeping arrangement. "AFRICAN AMERICANS DON'T SLEEP AS WELL AS WHITES, AN INEQUALITY STRETCHING BACK TO SLAVERY," lOS aNGELES TIMES, APRIL 20, 2017. This one got me some racist hate mail, so I must have done something right. "HAPPY BIRTHDAY TO HENRY DAVID THOREAU, A GREAT SLEEP SCHOLAR,"LOS ANGELES TIMES, jULY 12, 2017. Ok, so I don't write the headlines, but here's my little tribute to 200 years of a world with Thoreau. "The Springfield Somnambulist: Or, the End of the Enlightenment in America," Common-Place, vol. 4, No. 2 (2004). Here's the piece that got me started on the topic of sleep. "Sleep's Hidden Histories," Los Angeles Review of Books (2014). "Confessions of a Literary Barbarian," Slate (2011). "Campus Security and the Specter of Mental-Health Profiling," The Chronicle of Higher Education (2011). For more, see my site at academia.edu.